“What do you think I’m up against?” says Gita Sahgal tersely. “The entire human rights movement—and the Islamic right.” The human rights movement and the “Islamic right” might seem, on the surface, strange bedfellows. But they have come together in her story—the story of Gita Sahgal vs Amnesty International. And, according to this outspoken India-born human rights activist, not just in her story. Since her suspension, earlier this month, from her job as the head of Amnesty International’s Gender Unit, the 53-year-old Sahgal has spent much of her time fielding calls from around the world that are jamming her phone line. The suspension, as anyone who has been reading the papers and watching TV knows, came after Sahgal spoke to the UK’s Sunday Times about her concerns over Amnesty’s relationship with Moazzam Begg, a former Guantanamo Bay detainee, and Cageprisoners, a charity of which he is director. A Spectator columnist dramatically said Sahgal had “blown the lid” on the relationship between Amnesty and Begg. She herself says she’d simply asked why the human rights organisation that employs her was happy to collaborate with a person and organisation whose views were, in her words, “abhorrent”. So certain is she of the impact of her suspension from one of the world’s leading rights organisations that she says, “The story’s not going away.” She is right. Since Sahgal was temporarily removed from her post, a Facebook campaign has begun to have her reinstated. Signatories to an online petition addressed to Amnesty International, expressing solidarity with Sahgal, include, among hundreds of others, Salman Rushdie and Amitav Ghosh. Sahgal’s been written about in Britain’s leading newspapers and websites, and also been interviewed by the BBC’s prestigious programmes ‘Today’ and ‘Newshour’. There have been both bouquets and brickbats—but almost certainly more bouquets. The Facebook group of Observer columnist Nick Cohen is titled “Amnesty International, You Bloody Hypocrites, Reinstate Gita Sahgal”. In it, he says Sahgal “is rightly sick of the lazy alliance between the supposedly liberal human rights world and the decidedly illiberal world of radical Islamists”. Sahgal’s timing is good: many have come to believe that white, liberal Britons and Americans were so keen to distance themselves from the excesses of the Bush administration that they leaned too far the other way. For many, Begg, a British Muslim whose father was born in India, is Britain’s most articulate critic of the Guantanamo Bay detention centre, where he was illegally held for three years. But for Sahgal, he is also “Britain’s most famous supporter of the Taliban”. While “horrified and appalled” by his illegal detention and torture, she argues that Amnesty could have, and should have, fought against torture without putting him on a platform. Chetan Bhatt, a professor of sociology at Goldsmiths’ college who has studied political Islam, agrees. “Moazzam Begg and Cageprisoners have actively promoted Anwar al-Awlaki, a self-styled preacher whose ideology implies that it is alright to kill civilians and undertake suicide missions and violent operations anywhere in the world,” he says. There are other views. “But we are all only four or five clicks away from someone who promotes violence,” argues Arun Kundnani of the Institute for Race Relations, London. “There is simply no compelling evidence that Begg espouses or condones violent extremism”. And Amnesty, skirting around the issue of what Begg stands for or supports, simply says that the organisation cannot pick and choose whose human rights it defends. “To argue that some people are more ‘deserving’ than others of having their rights protected is to argue that some beings are less than human,” it said in a statement. While the debate rages, it’s clear that Sahgal is becoming something of an international heroine; a just tribute, those who know her say, to this dogged woman’s fearlessness and integrity. She did not flinch from taking a principled stand, they point out, despite the inevitable risk, not only of hostility from her employers and the Islamic right but also the danger of becoming a “poster girl” of sorts for right-wing critics of human rights organisations—not a comfortable position for someone with her left-wing credentials. But Sahgal is not a stranger to principled—and contrarian—stands, sometimes delivered in a brusque, even aggressive, manner that earns her enemies for all the wrong reasons. The India-schooled daughter of writer Nayantara Sahgal (herself the child of Nehru’s sister, Vijayalaxmi Pandit), she plunged into activism after graduating from London’s School of Oriential and African Studies, a hub of radical left-wing views. 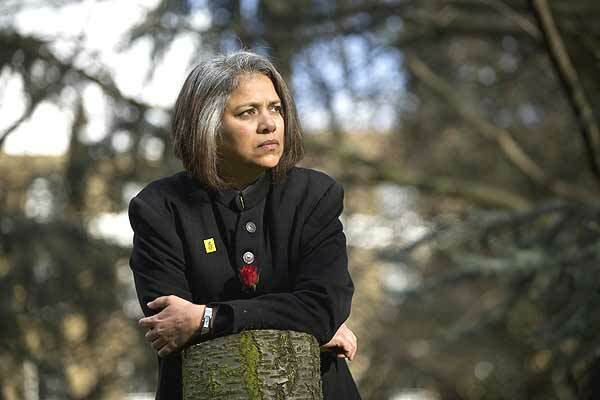 She was the co-founder of the influential Southall Black Sisters, and of Women Against Fundamentalism, formed around the time of the Rushdie affair in 1989. Typically, Sahgal and her colleagues argued—with women, among others—that it was not just orthodoxies among minority groups that had to be challenged, but also the fact that Britain was in many respects a Christian state. Nayantara, 82, closely following the current controversy from her home in Dehradun, has been a staunch supporter of all her causes. While she worries for her daughter, she also says Gita could have taken no other position. “If I look around the world for an example of shining integrity, I can’t think of anyone better than Gita,” she tells Outlook. “She has always been loyal to the principles of human rights.” Even if, clearly, it means taking on the human rights movement itself.